Camden has been coming to our farm, keeping our horses feet in great condition for a couple of years. He is a quiet man, and knows his way around horses. His interest and dedication to his craft is evident in his explanation of what he is doing as he works on our horses feet. He has a deep love and respect for all animals, and has never been rough in the handling of our horses. Camden has an excellent eye for any hoof abnormality, and corrects it before it leads to problems or unsoundness. 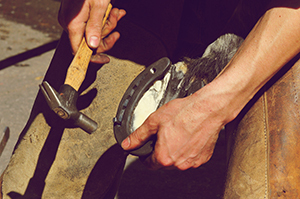 He trims to the correct angle, keeping the pastern hoof alignment perfect for each horse-never too steep or too low. You can trust Camden to deliver a perfectly trimmed and balanced foot for any equestrian discipline. On top of his excellent farrier abilities he is just a fantastic guy. He is very easy to talk with, and will quickly become a friend. He is punctual, neat, clean-cut, well spoken- just an interesting person that you will look forward to having out time and time again. 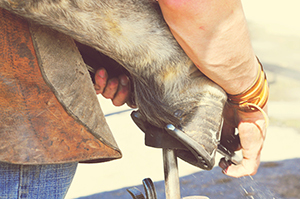 Based in Elgin Texas, I travel all over the greater Central Texas area providing farrier services to equine breeding facilities, ranches and private owners alike and often make trips to regular clientelle in as far as South Texas. 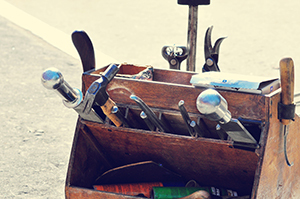 Give me a call and I will do my best to work my schedule around you.